Cook lentils at the beginning of the week, eat well every night. One of my secret weapons to prep for a week of quick and easy meals is to cook up a big batch of grains or legumes. It also makes a big difference if you have a few different recipes in mind so that you can keep things varied as the week goes on. Beluga lentils are one of my favorite legumes to have in the fridge. They are nutritious and filling and can be combined with so many different flavors. 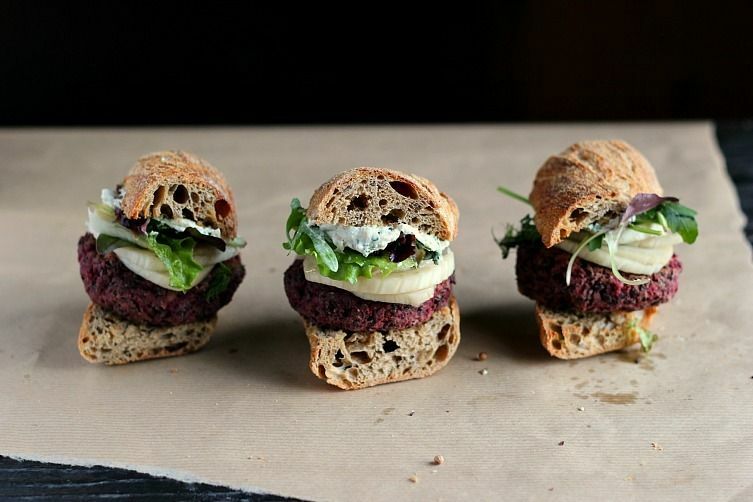 They are easily blended into hummus or a burger, or stuffed inside a big cozy sweet potato. If I have the time, I like to soak my lentils for at least an hour or overnight before cooking—I find this helps soften the lentils and also shortens the cooking time. 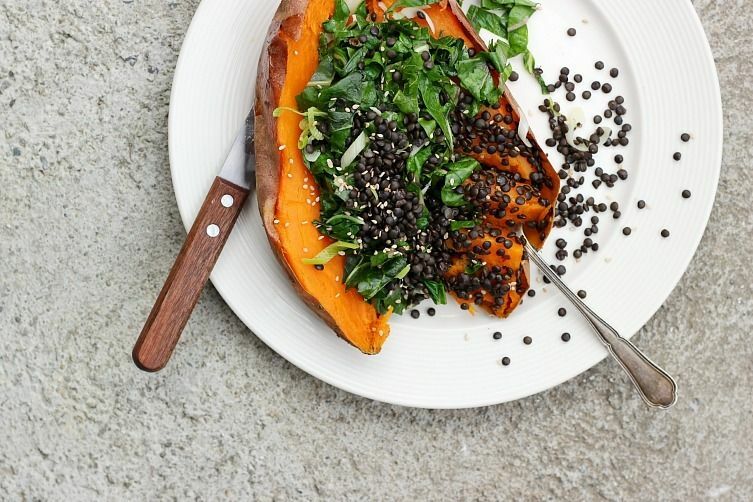 Lentils and sweet potatoes were made for each other, and this recipe is a really simple way to enjoy them together for a quick and easy weeknight meal. All you have to do is come home and pop the spuds in the oven. When the potatoes are almost ready, sauté dark leafy greens with garlic and dried chile peppers on the stove, and throw in cooked lentils when the greens are almost finished to warm them through. Stuff the cooked potatoes with the greens and lentils for a dinner loaded with spice and texture—cozy comfort all wrapped up in a sweet potato. This bright pink hummus is as flavorful as it is colorful, and it's also a great way to use up any leftover cooked lentils. 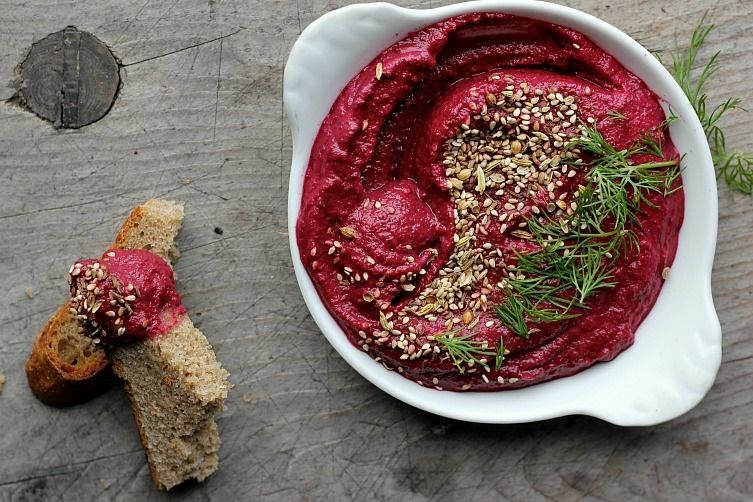 I much prefer to roast my own beets for this recipe, and once that's done, all of the ingredients are thrown into a blender until the smooth, pink, tahini-spiked dip is ready. For the best flavor, let this dish sit in the fridge for a few hours before serving. I love it topped off with fresh dill and caraway seed dukkah. 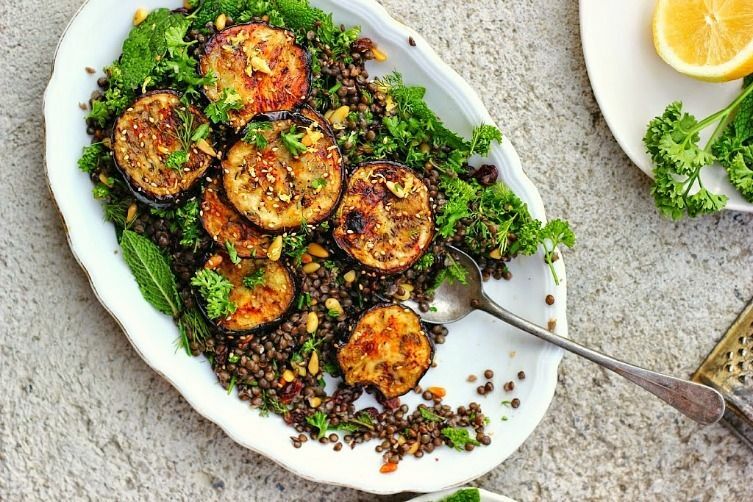 This fresh salad combines soft grilled eggplant with lots of fresh herbs and lentils. Along with hummus, tahini, and extra greens, the cold leftovers make great pita fillings. To make this recipe, it's best if you salt your eggplants first—I find it helps draw out the moisture and yields the best texture off the grill. Don't skimp out on the olive oil, either—eggplants love the stuff. Even though I'm a vegetarian, every now and then I just want a burger. And not just some tofu steak or portobello slapped between a bun—a real burger, something with flavor and juice and a really great sauce. This recipe takes a bit of forward-thinking—for both soaking the sunflower seeds and making the 'quickled' fennel—but both components make this dish so much more than a simple burger. And after those steps, the recipe comes together quite quickly—all you'll have to do is grab a napkin and dig in! 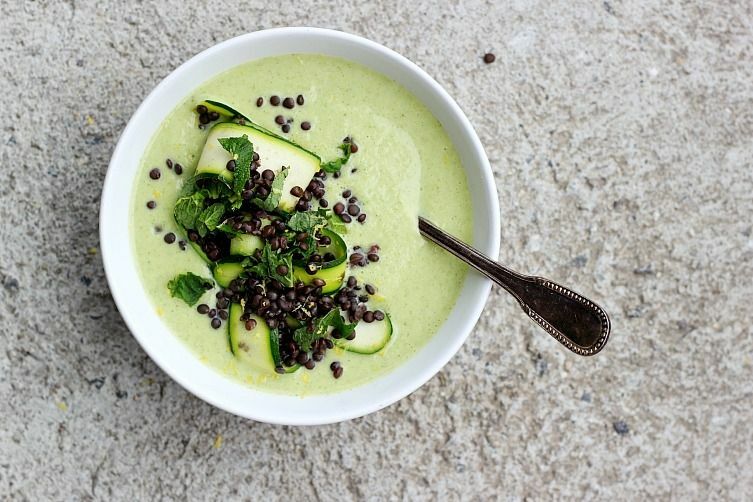 Cooked lentils make an excellent soup topping because they add texture and heartiness. And I also love adding almonds to soup because it adds tons of creaminess and flavor without dairy. Sometimes I toast the almonds beforehand, but here, I wanted the freshness of the zucchini and mint to shine through without interruption, so I used the nuts raw. 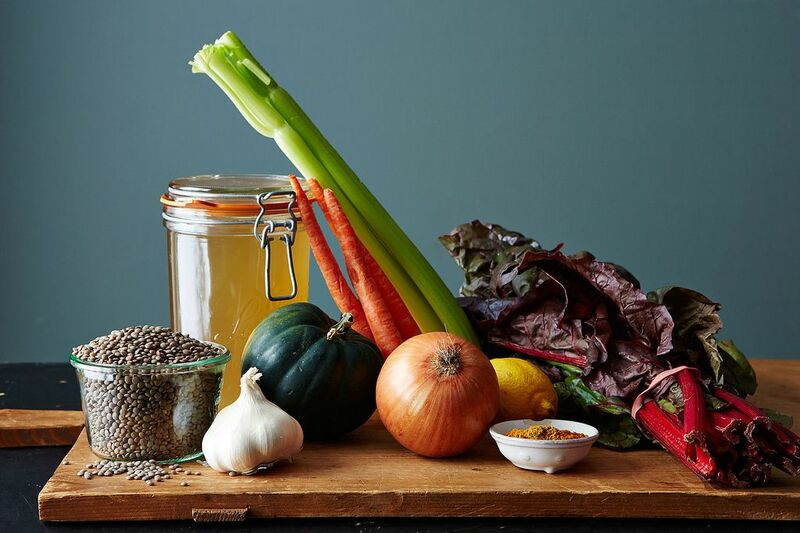 A rather quick preparation with minimal fuss yields a comforting soup with lots of leftovers, which can be served cold with lots of lemon and black pepper.